Dark as usual, I’m afraid. I welcome and would love to read your 55-word contributions. 1. Your contributions can be in prose or verse. 2. Please do make it count exactly 55 words (excluding the title, if any). 3. 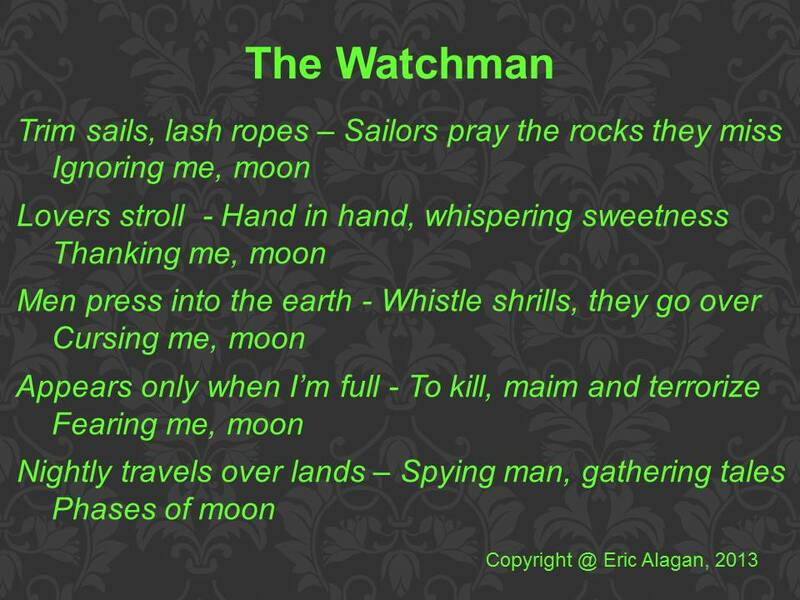 Your contribution does not have to include my title > The Watchman > rather, please draw off the Image, let your imagination float in the night sky. If you can leave your contributions in the Comments below, I shall be happy to post them in a Gallery on 28 May, giving you full credit and with a link back to your blog. Thank you, Uzo – I see that you’ve reposted this in the flash fiction gallery. Cool! 55 words though…I don’t think that’s possible in the case of Wolfie! Never was very good at short and concise lol 😉 You have some excellent ones here anyway! Hello Wolfie – 55 words is challenging, true, but you can do it, I believe. Yes, the contributions are great and will do great credit to the upcoming gallery. Hello Eric. Thanks for dropping in on my blog. Here’s an offering for your challenge. Still night, calm sea, full moon. Fathers in fitful sleep clutch weapons tight. For the splash of oars, boots crunching on the strand. Storm wind, high sea, moonless night, the watch slumbers. Mothers, fathers sleep while thunder roars and waves crash on black rocks. Dragon ships will not come tonight. Hello Jane – thank you for the return visit and ‘following’ my blog. I’m doing likewise and we’ll ‘see’ one another more, I reckon. Lovely ‘offering’ that’ll do the ‘gallery’ proud. Thank you. Sharing bits of fiction is such a good idea. 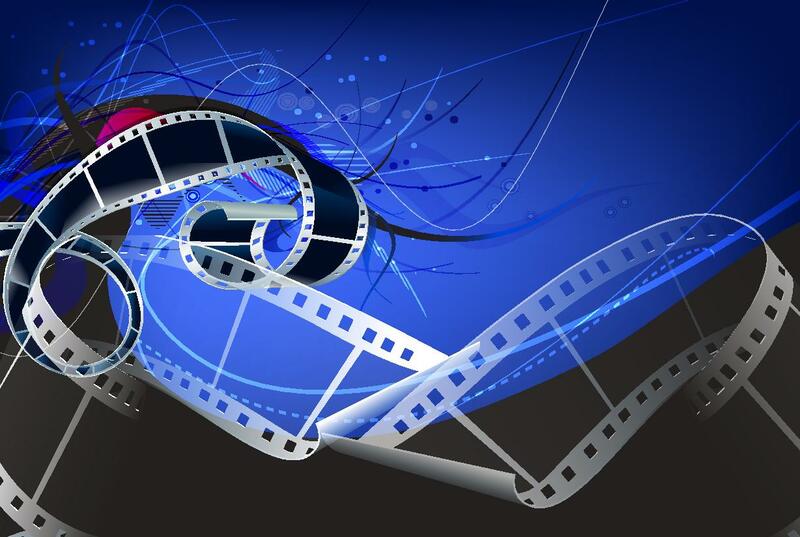 Many thanks for letting us use your blog as a show case. I am late. Again. Haha. But here is a cliche attempt on the moon. She is the clock to my curse. a revelation of what we are. we gaze at each other’s nakedness. No worries, Aubrey – you’re not late as the Gallery post date has been pushed back somewhat due to time constraints at my end. This is an apt contribution – werewolf and moon – trapped souls. Thank you for joining. Well, I do love your prompts so the pleasure is all mine. Then slowly ebbs until only the stars remain. ‘My friend the moon,’ he would say, pointing a chubby finger at the brilliant disc suspended in the sky. In response I would hold him close, inhaling his just-washed, little boy smell. I’m sure he would cry when his friend faded to a crust, but perhaps that’s just sentimentality rewriting the story. For my sake. You’re very welcome and I love this. One minor issue – your blog does not show up, only your yahoo email came through here. Can I have your blog link please. The following is loosely based on a collection of moon haiku I have written over the last few months. I hope that’s OK. I know it’s probably an obvious choice, but I’d like to call it ‘Reflections.’ Thanks for providing this opportunity – Marcus. Spring moon – looking down on the turbines once more. Glad to have hooked you into contributing 🙂 You honour me with your presence and contribution. No problems if it’s one that you’ve already posted on your blog – important thing is, it’s yours. “Reflections” is apt, I reckon. This hasn’t been posted on my blog in this particular form. I changed the haiku to one line each, rather than three and adjusted the wording (particularly the last line) so it’s more of a coherent whole – I hope. It is more than coherent, and wonderful, Marcus. If you are a fan of flash fiction- this is some of the best I’ve seen anywhere. Very creative, spontaneous and beautiful. You bet! I loved the imagery of this one-so textured and rich. Gave me goosebumps. I appreciate you thinking of me and passing this on. Thank you. You and Yoshiko have always been very sweet and a delight for me to get to ‘meet’ in Blogsville. Watchman stares as if he knew my name. His slow slow blink un-nerves me. the Ruler of the Night contemplates my face. Will he give me leave to go? The sun’s harsh bleach burned my sight. his gentlest touch could scatter me like ash. Hey, Eric. Thanks for another spur to write something. Hope all is well down there. Our friend Lisa is leaving in late May to visit Singapore for a week – visiting a Chinese family for whom she once did child care and to whom she became close. You may see each other on the street and not realize it. Isn’t that a strange thought? Nice to have you drop in and with a contribution too – this is great, my friend 🙂 And happy to have spurred some writing. All is well, thank you. Trust you and yours are good too. Your friend, Lisa, will find Singapore transformed, I’m sure. No Lisa is plain old American, born ten miles from here, never been out of the country. It will be an adventure for her. Her dad is a deacon in a nearby church. Thanks, Carroll – appreciate that. Then, what she’ll encounter will blow her mind – in a nice way, I hope. I’m especially pleased as two of these awards are new for me – Interesting Blog Award and Super Sweet Blogging Award. Thanks, Eric! I was super-challenged yesterday. I’ve been promoted at work and have been putting in ten-to-twelve hour days for the past week, straightening out the messes my predecessor left. (She was fired.) :0 I’ve also posted this in my blog. As always, thank you for your encouragement. Peg. Beautiful words, Peg. I liked the cadence to your poem. It was a pleasure to read. Thanks Eric for doing this. Really appreciate it. I think that layout is better! Thanks again. Okay, got it – I’ll use this layout, Ben. I also agree – since I use frames to display, this is better for me too – as “tall” posts mean smaller fonts. You, O Lord, are my Watchman. To keep me from evil. What type of feelings does it strike to you? You see one light while I see many, enough to light my path round and round. A trick of the eyes you see; instead of two I have eight. I know you are kind for you have not killed me; I ask now one favor, artist to artist: don’t destroy my creation, my beautiful web. Seems the moon gets blamed or cursed, or praised or worshiped, depending on what one expects or wants from it. 🙂 I will try to see what I can come up for the prompt, too. Absolutely, Joyce – all see the same, and each perceives different. I usually hold the window open for 10 days – hopefully, it is sufficient. Would love to receive your contribution. It travels the eternal sky, merely a crescent, adorning it like a sliver of silver, an enchanting jewel. Slowly it blooms. A silver plate now, blinding and ravishing! Seen sometimes as a sliver and when the time comes: the blinding silver plate. Thank you for this lovely contribution. I can’t see your blog and also don’t have your name – if you would supply this, I shall include in the Gallery. Otherwise, I’ll go with what I have and credit it as “Copyright @ Miles To Go”. I am surprised the blog is not showing up (http://gomiles.wordpress.com/). You can put me in as Nivedita Shori. I am honoured to be part of your artistic gallery! Thank you for the reply – you are coming through with only your gmail address and nothing more. Perhaps it has to do with your “Setting”. Anyway, I’ll fly with what you’ve provided. Change from May thru June. It prompts grown men to croon. As branches they do prune. Tides fill and drain lagoons. Thank you for joining to make the Gallery fun filled – much appreciate this. Happy to appear on your blog. Thanks again. I’d like to make a contribution here for the first time. In calm circles across the sky. Of the one who sees all things from above. You’re very welcome, Nicole, and thank you for your contribution. I’ll be happy to include your poem in th forthcoing Gallery. Great visuals to your poem. You managed to conjure quite a lot into such a compact format. Each line in itself could begin another tale. Nicely done! Here’s my take on it, clocking in at 55 words, minus the title. It’s an acrostic poem as well. Enigmatic is our sensuous Moon. Never too long so veiled. Thank you for the great prompt, Eric. It, as always, inspired me. 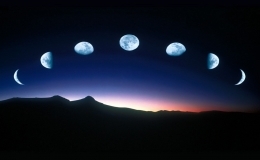 Dear Paul – Phases of the Moon does hold many meanings depending on the situation one is in. I tried to convey this and glad that you enjoyed it. My stride is slow and labored, knowing that each night draws me closer to a freedom and a curse that can only be ended with death. Freedom bringing invincibility, a curse that causes death for the unfortunate soul that crosses my path. While praying for the end of the full moon, to walk upright again. Thank you, these short flash fictions are fun and challenging trying to say something in very few words. Thank you for letting us contribute. An exuberant topic and image! My favourite ! And here are the lines for it! diminishing with the rhythmic pattern of destiny. Universal world vision completes our union. Our union now in space and time. Some say it’s lonely here and long for home. They long for safety and anonymous crowds and mother’s breast. Me and mine will craft a future. We’ll build a place where a man can be counted. In ten generations this planet will be an Eden. What will they say then?